Hultdins “SuperGrip” grapples are standard on most forestry forwarders on the market and very popular on self loading timber trucks. Hultdins grapples are also used in various Rototilt applications and are ideal for landscaping on mini-excavators. 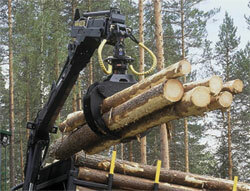 Hultdins “Supercut” saw systems can be found in most makes of timber harvesters, processors, delimbers, and grapple saws. Hultdins saw systems are a self contained unit feature automatic chain tensioning, built in proportional lubrication systems, and fast replacement of the chain or bar. Hultdins Inc. is the Canadian distributor for Indexator rotators. Indexator is the world’s leading manufacturer of rotators. Indexator rotators are standard with Hultdins grapples but are also used by other manufacturers of forestry equipment and can be found in many construction, recycling, and material handling applications. Hultdins has recently launched a new web site, www.hultdins.com, that covers all details of their grapples, saw units, and rotator products for the forestry, construction, and material handling industries.